In Europe there are very strong differences in public health (life expectancy differences between nations up to 15 years, health share of GDP ranging from 3.8% to 9%, etc...).As a result a uniform regulatory system is highly required. 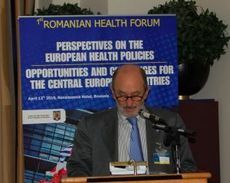 Then it's necessary an European Public Health System where health promotion can have equal dignity of health care, where the role of implementation actors is clearly defined and assigned to the regions, where it's favoured the bottom-up planning methodology which means participation, consent and control, with full involvement of local health autorities, municipalities and civil society. At present the European public health systems are fundamentally based on drug and hospital, which together absorb about 97% of health spending, leaving to Health Promotion the remaining 3%. Adding to these two pillars the third pillar of Health Promotion, you can significantly reduce the future demand for treatments and care. The right to health is not sufficiently equipped with budget coverage, despite the fact that the European regulatory framework supports the centrality of the right to health also in the sensitive areas of growth and competitiveness. It's therefore needed a reconfiguration of the relationship between rights and budgets in order to respect the universal nature of the right to health, also through a better survey of needs using the bottom-up planning. Undestanding economical features and value of health promotion and equity in health is not a simple matter. Inside health circle health promotion on a large scale , (that is the same to say in an equitable manner), does really mean to reduce healthcare costs improving wellbeing and quality of life of people, independently from their social and financial conditions, making them strong against diseases raising efficiency of workers and independency of ageing people. Outside health circle health promotion represents an important component of common good , at the basis of the wealth of the States. Development and progress are often used as synonyms. That's not true: developmente means to produce health, progress means to distribute it through common good. While we're able to measure development and call this measure GDP, we're not yet able to measure progress and we have no quantitative and qualitative perception of common good adequacy. Health promotion is a basic expression of progress . To put money in it does really mean to ensure high progress level of population. In a world that is experiencing for the first time in mankind hystory the coexistence of a financial market 12 times the world GDP with democracy, with continuos loss of public and private funds to financial markets it is difficult to imagine a rights&budgets balance.